My eldest daughter has been sewing wee dolls for many years now, and it is with great pride that I have watched her design and create her first collection of mermaid plushies (which in the common parlance of the good old days are "stuffed toys") and make her own Etsy shop TheIvyTide. I'm not crying, really I'm not. Just the sun in my eyes - making them water. Here is a wee video of her progress over the years. The other little ones, not to be outdone, have created their very own dog - due to the lack of dogs on tummy mountain. He gets dragged around on a rope and barks as he goes round corners. What a beautiful collection of mermaid plushies! Ivy certainly is a talented young lady, and you have every right to "have the sun in your eyes". No one is outdone on Tummy Mountain. 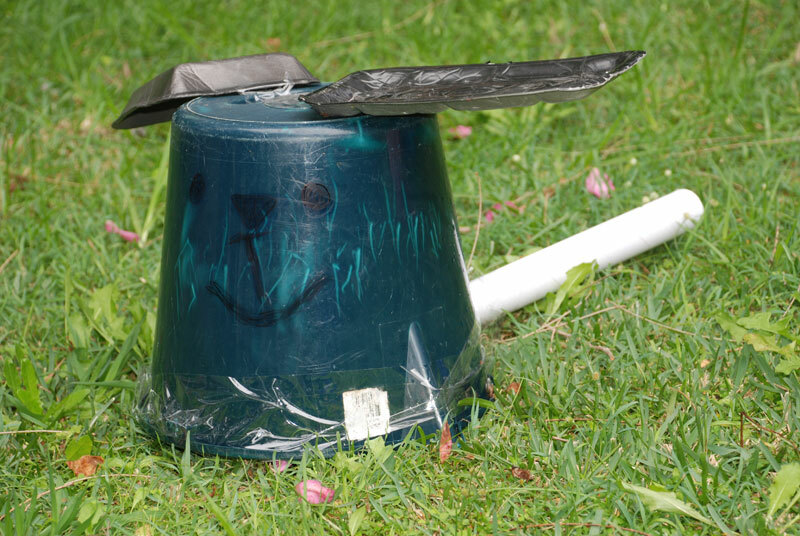 Bucket Dog is adorable too! Where did you all learn to be so creative? Thank you Martha, she is indeed! The sniffing noises I am making are just allergies - nothing more. I don't know where all the creativity comes from. I would say from having a good and hearty breakfast - like porridge! I am honored to have had a hand in naming your friendly (I am assuming) pooch. I do think I saw him wag his stubby little tail. Perhaps I should be eating a bit more porridge myself. I need a boost in my creativity. Very, Very happy to be acquainted on your blog. I just read to Ivy your comment and she was very happy. It's been a bit busy here at LizzieMade Studios... so busy, that I even Missed the Grand Opening of The Ivy Tide. How sad, to have missed these beautiful mermaids (and a chance to have one for a friend). If there should happen to be more mermaids - or other lovely plushies - I have made sure I will know about it, by Favouriting Ivy's shop. Ivy, you obviously take after your mum and dad - you're very talented! There are all kinds of things around about me. there are books and tables, and under me is a chair.